When you are involved in a semi-truck accident the San Antonio area, the risk of permanent debilitating injuries is magnified by the weight differential between an 18-wheeler and a passenger vehicle. A fully loaded semi-truck can weigh 25 times more than an economy car. When a trucking collision that causes a fatality occurs, the party who dies is the occupant of the other vehicle 98 percent of the time. Although a truck driver can be financially responsible for injuries or a wrongful death, the truck driver typically will not have the assets or insurance coverage of a commercial carrier. Negligent Hiring: Commercial carriers have a legal duty to perform a pre-hiring investigation of drivers before they are hired. This duty includes performing a screening for drugs or alcohol. When the trucking company hires a driver despite a record of serious traffic safety violations, DUI convictions or prior crashes, an injury victim can seek compensation from the trucking company based on negligent hiring. Vehicle Maintenance: Because a fully loaded tractor-trailer can exceed 80,000 pounds, trucking regulations impose a duty on trucking companies to conduct inspections and perform maintenance on these massive vehicles. Sometimes companies cut corners to save money, so inspections are neglected and necessary maintenance is disregarded. The result of this failure to keep trucks repaired and operating safely can result in failed brakes, tire blowouts and runaway trucks. Our Texas semi-truck lawyers inspect a company’s fleet maintenance records and engage trucking engineers or maintenance experts to examine big-rigs to identify negligent maintenance by the trucking company. Negligent Supervision: Even if there are no red flags in a potential employee’s pre-hiring record, trucking companies have an ongoing duty to monitor the safety practices of their drivers. When commercial drivers violate traffic safety laws, trucking regulations or cause semi-truck crashes, their employers have an obligation to take negligent drivers off the road. Hours of Service (HOS) Violations: Driver fatigue is a common cause of crashes involving 18-wheelers. Truck drivers are obligated to comply with hours of service (HOS) rules that limit their hours behind the wheel and necessitate minimum rest periods. However, these regulations are routinely disregarded often with the tacit or even express approval of trucking companies. Commercial carriers can increase profits by creating compensation plans that encourage drivers to exceed HOS rules or imposing unrealistic delivery schedules. When trucking companies do not enforce HOS rules, this is a common basis for imposing liability on trucking companies. If you or someone close to you has been injured in a tractor-trailer crash, our San Antonio trucking accident attorneys have the expertise and experience to hold trucking companies accountable for accidents causing serious injury or death. Our law firm provides statewide representation with offices located throughout Texas. 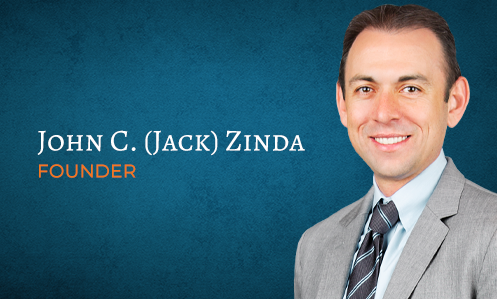 The San Antonio injury law firm of Zinda Law Group offers free consultations, so we can evaluate your case and discuss your rights and remedies. No Recovery, No Lawyer Fees. Call us today toll free at 800-863-5312.